In today’s politically-correct World where the roles of the sexes seem to blur, it is much harder for someone like me to be reminded of what it’s like to be a man in the most virile sense. Women are working and bringing home the bacon while Daddy’s like me are increasingly becoming house-husbands with domestic responsibilities that run the gamut from cooking, cleaning to booger-cleaning. It’s no wonder that us Mommy-Daddys desperately need a conduit to protect and defend our virility before we actually start growing breasts of our own. Hence, the existence of the High Rock Challenge. 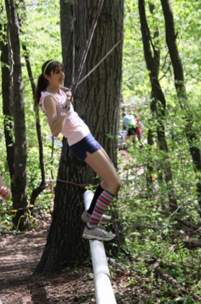 I have been fortunate to participate in the High Rock Challenge for the 4th year in a row now. 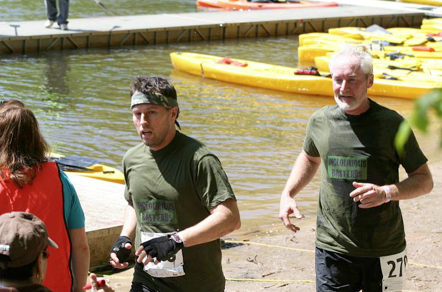 This Challenge is not just a running race, but rather an experience that with each event redefines what it is to be a man on a very visceral level. 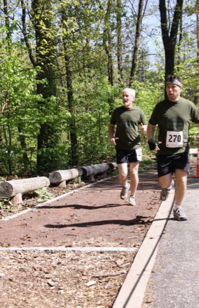 The race consists of two-man teams that start out running through the woods of the Staten Island Greenbelt. As we continue running along a 7-mile-plus trail marked only with small pieces of neon-orange tape throughout the entire distance, we must overcome several mystery challenges throughout the course in order to complete our quest of reaching the finish line. Most of these are physical challenges requiring strength, balance, mental fortitude and ingenuity, or a combination of all four. 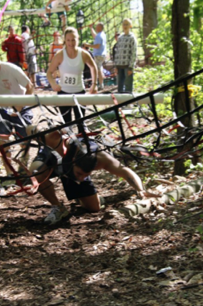 Whatever the challenge, we must stay together as a team, which is the basic premise of the whole event. This year, the competition has over 300 teams and the name of our team is the Inglourious Basterds. Yes, today my partner Mark and I are Basterds and we are determined to get through all the challenges as quick as possible to have a good finishing time. 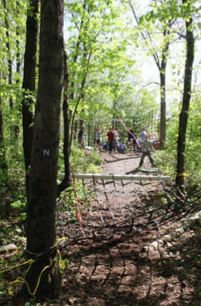 As we, the proverbial hounds, are released into the woods in between other teams with staggered start times (the trails are too narrow to allow all 300 teams to be released at the same time), the first mystery challenge is already looming in our minds. 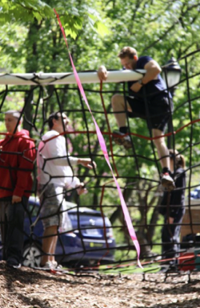 After running for about 1/2 mile, we come across our first challenge: a 10-foot-tall cargo net hanging between two trees. We must scale it in order to continue our course. We both scale it with no problem. Immediately after that, it’s Mystery Challenge #2: The Rolling Tube. Only one of us has to do this challenge and I decide to be The One. I have to walk across a thick PVC tube that loosely rolls around a rope as I try to support my entire body by hanging onto a rope above my head. Basically I am walking across a tight-rope, only that the tight-rope will spin if I walk across it too fast or with too much of my own weight on it. I make it across that challenge fairly easy. After that, we continue running through the woods, up and down hills for the next two miles. What becomes very noticeable is that these two miles of trails are infested with mud, and not your typical run-of-the-mill mud; this mud is freaking quicksand. There is so much mud that our only course of action is to run like hell straight through the middle of the mud with the hopes that we will come out of it unscathed with each mud pile we encounter. Mark actually got stuck in the mud at one point and it literally almost sucked his running shoe straight off of his foot. As we overcome the Mud Issue with our run-like-hell running strategy, we finally arrive at a new mystery challenge that will define the insanity of this race: The Drainage Pipe Crawl. At this point, in order to continue along the race course, each one of us must crawl through a 20-foot-long drainage pipe that has a roughly 3’x3’ opening. If you are claustrophobic, this is the point where you will hang up your running shoes and quit the race. After crawling through the pipe, we had to run uphill through a babbling stream for about 1/4 mile. Our running shoes were soaked to the bone, which was a welcome relief since the water helped clean off most of the mud that had become caked onto it early on in the race. We were now running again on high and dry terrain. Our only issue now was the hills; the course was infested with steep hills that we had to scale repeatedly. My quadriceps, that chunk of leg muscle between your knees and pelvis, was starting to burn from all the hills I was scaling. We finally came to an area full of what looked like a bunch of befuddled runners holding maps. This was the location of our next mystery challenge. We were given a map of the woods and were instructed to find six locations on the map, each location holding a special hole puncher. We had to have six numbers on our map punched at these locations in order to finish this challenge. The catch was that your teammate had to run while carrying an 18-pound sandbag. Luckily, Mark took the sandbag job while I was in charge of the map. After getting a little lost on a few occasions, we managed to get all six numbers punched correctly, and we were off to continue the race. We finally approached a lake where our next challenge was awaiting us: kayaking across a lake. This was a welcome relief from all the running we were doing, for our arms did all the work while our legs rested. After rowing our kayak around a buoy in the middle of the lake and coming back to shore, we were off again to continue pounding our legs on dry land. We ran and ran and ran, up and down hills, over tree stumps, rocks and through thorn bushes. Finally, after running a good mile or two, we came across our next challenge, this time a mental challenge. We were given a list of 25 scrambled nature words and we had to unscramble five of them. Putting our two brains together really helped, for each of us was able to unscramble the two or three words that were necessary to continue going our course. As we came down the road and up the driveway of the Greenbelt Recreation Center, we can just smell the finish line. However, we had one more mystery challenge and it was less than 20 yards away from the finish line. 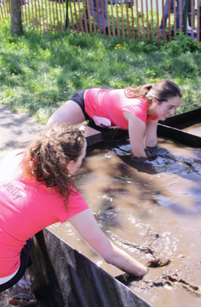 We come across this challenge seeing a lot of other runners dunking their tired filthy bodies into several wading pools filled with murky dirt-infused water. The goal was to find three ceramic tiles hidden in that water that spelled out our team number. Blindly, we searched and searched and searched for our numbers to show up and after a few minutes of frantically acting like two dysfunctional pigs in a pig sty, we found them! Once an official checked the number on our tiles to the number on our shirts, we were home free. 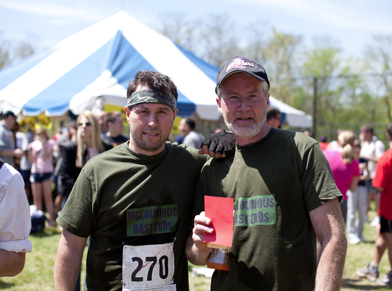 After we crossed the finish line, a renewed sense of masculinity got pumped into my being, the kind that cavemen must have felt when they came home to the family dragging a saber-tooth tiger by the tail for dinner. I am man and I ate dirt today and I loved every bit of it.